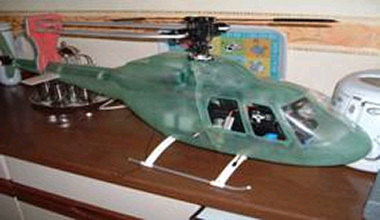 My helicopter experience started in 2003, when my wife caught me looking through the Ad Mag looking for a second hand IC helicopter. Never having flown anything more than a kite before, she suggested buying new and building it myself, because when I crashed it (as if!!! ), I would know how to rebuild it. I contacted a local model shop who put me in contact with Graham Fox - son of the famous Arthur Fox, well known in fixed wing circles. Graham suggested purchasing a Moskito Basic - a very steady model to learn with, a 30 size machine that was fitted with a Webra 50 size engine CSM 200 giro and JR XP652 radio. I purchased this and also all the field kit required. 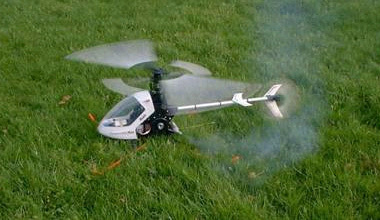 Once built, I took it to Graham's to have it set up and test flown. After several months I did manage to get this machine off the ground without it disappearing in any direction. In fact it was like riding a bike - it seems impossible but sooner or later after many hours of frustration, you wonder why it seemed so difficult!!! We then arranged to meet at Langar airfield for my first lesson, after fitting the training undercarriage (to stop me tipping it over!). I was told to first point the model into wind, increase throttle and increase pitch till the heli got light on its skids - the perfect way to try and control the beast. I realised very quickly this was going to take some time and lots of patience!!! For my next birthday I was given a large box, and to my surprise it was a Raptor 50!! This model was far more responsive. 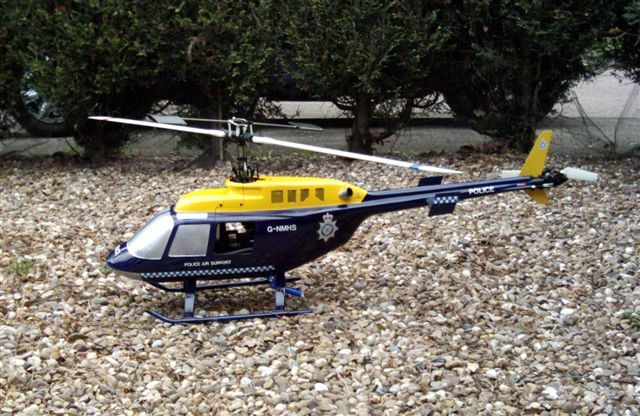 By this time I was looking at body kits from Funky and decided that a Eurocopter kit would fit this heli. This kit was quite easy to fit because it was practically transparent, so the necessary clearances were obtained. 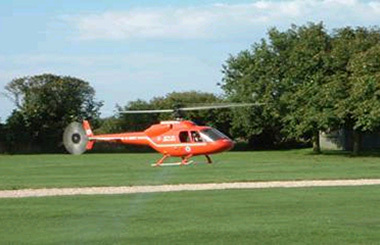 Once all was secured, the helicopter was test flown and with the body shell being very light - no adjustment to CofG was required. 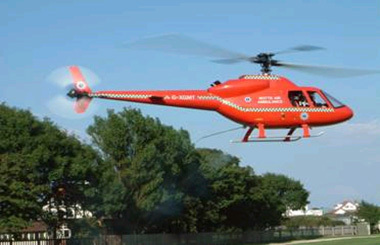 In fact the body made it easier to fly because of the orientation, so it was back to the workshop for a paint job. After finishing the paint job, I wanted some stickers. I contacted a company in Ilkeston who make the reflective decals for police cars, etc. I made the artwork on my pc and scaled them to fit. The result, I think, was very acceptable for my first attempt at scale models. The mechanics are a 30 size Shuttle, purchased second hand complete with 28 sized engine. 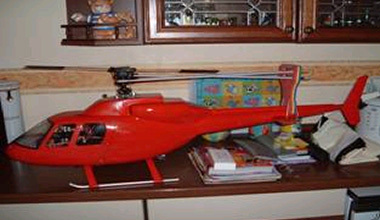 Also with this heli was a fibreglass fuselage straight from the mould, in bright red. Phil cut windows in the sides to allow for ventilation and fitted it to the Shuttle and test flew it. The main problem was that with the fuselage being fibreglass, it was heavy and with a small 28 size engine, overheating occurred on warm days. Otherwise it flew very well. Total cost up to date was £95.00. Phil then stripped the fuselage of mechanics and started to spray with paint aerosols from a local car accessory shop. The stickers were designed by Phil and a local print shop then produced the actual size he had specified. He says that he has just removed the fuselage so he can use the basic heli to advance his flying skills, thinking there won't be as many pieces to pick up if the fuselage is left at home!! 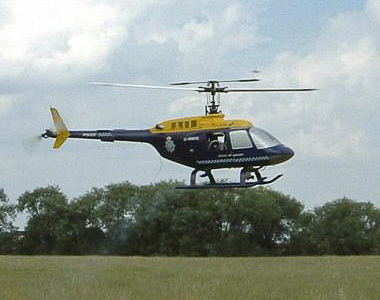 All this model needs is a big searchlight, a noisy exhaust and for it to hover over my house at midnight. I will then feel at home and able to sleep.